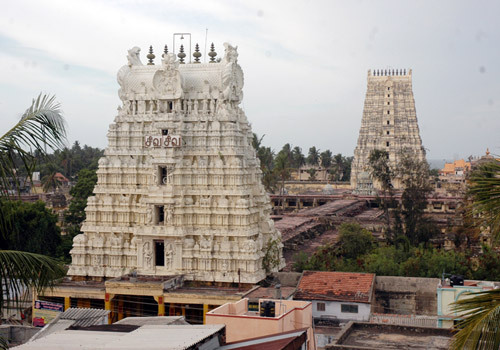 Sri.Parvadhavardhani samedha Sri.Ramanadha Swami temple is one of the 12 Jyothir Linga temples in India & is the only one in South.It is located 200 kms east of Madurai.After killing Ravana & bringing back Sita,they land here at Rameswaram to to ward of "brahmahathi dosham" caused by killing of Ravana. 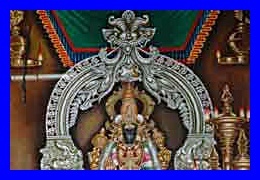 Rama instructs Anjaneya to bring a Siva Linga from Kasi kshetra for doing Siva Pooja at Rameswaram.As it got delayed,Rama asks Sita devi to make a Siva Linga in sand to perform the pooja at the scheduled time.As the Pooja was started, Anjaneya was angry.To cool him, Rama makes it mandatory that whoever comes to Rameswaram should have to worship first Kasi Viswanadha brought by Anjaneya & then only Sri.Ramanadha made by Sita.Vibishana also affected by brahmahathi dosham as he helped Sri.Rama to kill his brother Ravana.He worships here & performs Sivapooja.God Siva is very much happy to see his devotion towards him & appears before him.He enters the Siva Linga worshipped by Vibishana in the form of light ( Jyothi ) & it is called "Jyotir Linga".Those who have "phithru,naga,Rahu,Kedhu dosha" ( any one of these ) in their horoscope should bring their parents here & perform the required dosha nivarthy parihara(clearing away) so that delayed marriages,delayed child births can be avoided. 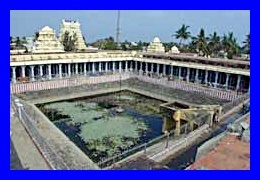 Unity in the family & development of business or jobs can be achieved.Here one can perform these dosha nivarthy homams through out the year,where as in other holy places you have to perform in a specific day & time in a calender year.The homams performed here yield many folds of benefits to the devotees than done in other places.Holy bathe in seas & rivers in other places have particular days marked for it like full or new moon day .You can take holy bathe here on any day.As Rama (Vishnu) worshipped here,holy water is given as prasadam in Siva Sanctum.Sage Pathanjali got liberation here,his adhishtanam is located at the backside of Sri.Nataraja shrine.This is one of the temples sung with holy hymn Devaram & also one among the 51 Sakthi peetas. 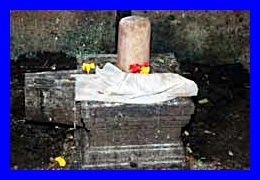 In the moolasthana, spadiga linga established by Sri.Adi shankara is worshipped.In the Swami Sannidhi prakara,two Siva lingas are flanked by Goddess Saraswathi,Sankara Narayanan,Ardhanareeswarar & Ekadasa Rudralingam(11 Sivalingas).In Goddess Parvadhavardhani Sannidhi,Ashta Laxmi & Sandigeswari facing west direction are located.Those who want to make Kasi - Rameswara theertha yatra should first take a holy dip at Agni theertha here & take with them holy water& sand taken from Agni theertham to Kasi.They should offer the sand in Holy Ganges & bring Holy Ganges water from Kasi.They should offer it to Sri.Ramanadha( sprinkle & bathing).Starting from Rameswaram & ending it there.Parents of Sri.Saradamani devi (wife of Sri.Ramakrishna Paramahamsa) has come all the way from Calcutta by walk to this Holy place & has worshipped here.Here ocean is very calm , In Dhanuskodi also water is shallow, does not look like ocean, where as the opposite side it is furious.It looks like a knife separated by two oceans.One has to take a jeep drive to reach here.21 kms away from Rameswaram, out of which you have to travel 5 kms in sea sand & during high tide time water covers a large portion.Rameswaram is an island.One has to cross "Pamban Bridge" to enter Rameswaram.Both Train & Bus services are available.Lot of lodges are available.Many priests are available to perform the homams.All the groceries & vegetables required for the public are coming from Madurai.Besides this, this is fishing place.Sizable fishing community is here. Only one High school is there.No college.Our late President Dr. Kalam's residence is here. 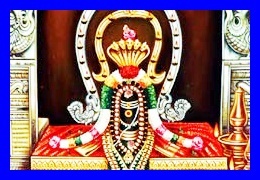 Goddess Parvadhavardhani.Below Jyothir Linga,Moolavar Ramanadha,Alli kulam(theertham inside the temple),Temple towers & Ramanadhar.Our sincere thanks to Dinamalar Magazine for the photos.